I originally wrote the article below for my local food bank and have deiced to share it on my blog because it provides an insight in to what can be classified, officially, as a “healthy” diet. Take some time to have a good look at the photograph of the food parcel before reading further. 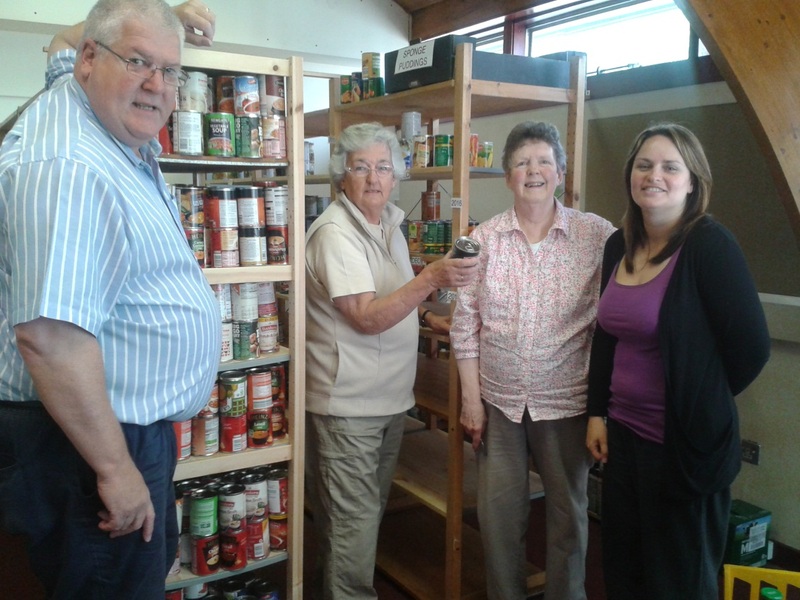 Earlier this month I met Peter Dicker and his lovely staff (pictured below) at the East Lothian foodbank in Tranent. Fortunately I’ve never needed to use a foodbank so I didn’t know much about them. I was curious to have a look behind the scenes because there has been so much controversy about them in the main stream media and of course I am interested in anything “food”. Foodbanks receive food donations from people and organisations, the food is then sorted and packed in to food parcels which is then distributed to those in need. Much reporting would perhaps lead you to believe that foodbank users simply spend all their money on “non-essentials” and have nothing left over for food. Not so. Users of a foodbank require a “crisis” referral from a doctor, social worker or other suitably qualified professional and are usually only permitted three uses of the food bank in any six month period. I asked Peter what I could do for him as a Nutritional Therapist and he said that to his knowledge no one had ever analysed the nutritional content of a food parcel, so I took one away to analyse. When Peter was explaining some of the logistics of foodbanks I found it fascinating that the stock is managed not by product but by total weight. Peter also explained that it is foodbank policy that no food should be perishable. As a Nutritional Therapist I am often explaining to clients the importance of quality and variety of food (i.e., fresh and seasonal) and one of my favourite sayings is “good food goes bad”. Above is a picture of all the items contained in a food parcel designed to feed one person for three days. The foodbank in Tranent is different from most other foodbanks in that it also provides a bag of fresh fruit in the summer and vegetables in the winter. The three day food parcel meets calorific intake for a healthy adult male. In fact there are nearly enough calories in the parcel to sustain him for four days. 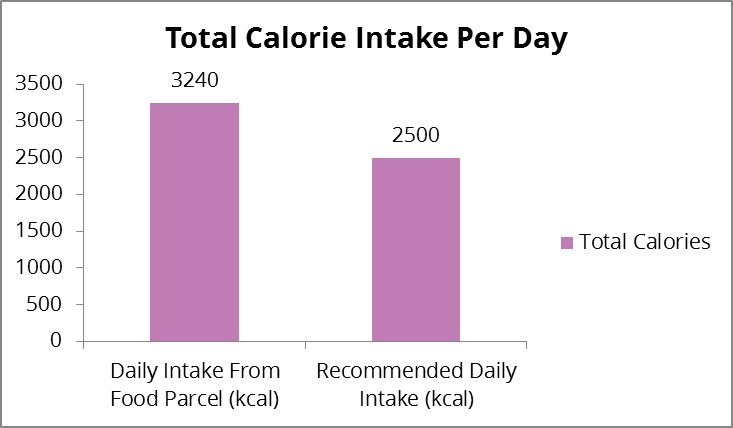 The food parcel meets or easily exceeds the recommended daily amounts for macro nutrients however this is not necessarily a good thing. More about that later. (Click on graphs for bigger images). 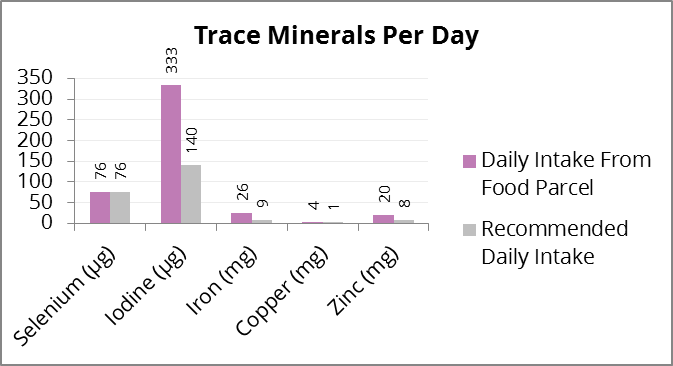 All vitamin, major mineral and trace mineral requirements are met by the food parcel based on current recommended daily amounts. Using these criteria the food parcel has plenty of 5 a day candidates including tinned tomatoes, sweetcorn, peas, chick peas, baked beans, fruit cocktail, peaches, a jar of pasta sauce and a carton of unsweetened orange juice. The 5 a day guidelines are based upon 5 portions of 80g (i.e., 400g per day)(2). Excluding the orange juice the other items listed above provide an average of 1,180g* a day of the 400g 5 a day requirement. *It should be noted that the food parcel product weights include the liquid which should not really be included however there are other products in the food parcel that contain fruit and vegetables which cannot be identified individually and therefore were not included (e.g., tins of soup). The World Health Organisation (WHO) has recently suggested that people reduce their sugar intake to the equivalent of 5% of total calorific intake(3). Based on our (rather generous) 3,240 calories a day that equates to no more than 41g of sugar a day (4 calories in 1g of sugar). The food parcel provides nearly four times that – a whopping 163g a day. The adverse impact that sugar can have on our health is such a big subject that it’s something for another article but suffice to say 163g of sugar a day is not good by anyone’s standards. In the methodology section (at the end of the document) I explain that the research data has been taken from the “COFIDS” database which is comprised of various food composition tables. Unfortunately food composition tables have a few problems(4). Although food composition tables have their problems there really is no other effective way at present of analysing dietary intake, so bear in mind that the findings presented here are not exact but indicative. Having said that food composition tables have some problems they can be very useful for spotting trends over time. The food tables have been going in one format or another since the 1940’s. Researchers David Thomas and Anne Marie Myers have both written about an alarming trend in the depletion of key nutrients in food over the last five decades. Basically, we have to eat more of pretty much everything just to get the same nutrient intake as we would have done in the 1940’s (5), (6). 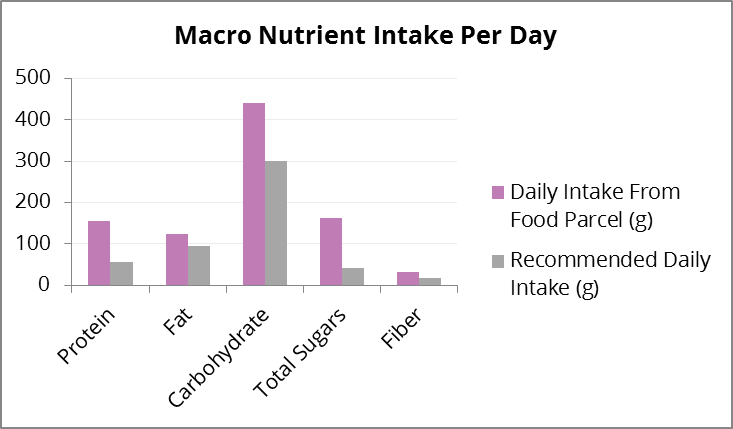 The recommended daily amount (RDA) is one way of measuring nutrient requirements. RDA’s are by definition designed to be applied to groups of people rather than individuals with the sole purpose of minimising risk of under nutrition (7). We may need much more of a particular nutrient if we are looking to optimise our health. Dietary reference values (which include RDA’s) are meant to be applied to healthy people(8). Furthermore the metabolism of many medications can deplete the body of certain nutrients(9). For example, taking the oral contraceptive pill may deplete folic acid, magnesium, B6, B1, B2, B3, B12, C and zinc and proton pump inhibitors (e.g., Omeprazole) may deplete folic acid and B12(9). There are many more medications associated with nutrient depletion. Dietary reference values vary greatly from country to country for example the UK RDA for calcium is 700mg (10) whereas the US is 1000mg(11). The data shows us that food parcels meet all nutritional requirements for a healthy adult male as currently set out by the government. The only problem is the excess sugar. For three days I think that the food parcels are absolutely adequate and a far better alternative than not eating at all. Over the longer term consuming only the types of food in the food parcel could present some problems. Canned foods contain a chemical called bisphenol A (BPA) (13), (14). (This is the chemical that was eventually removed from baby’s bottles). BPA is toxic to the liver, reduces sperm quality/count, affects foetal development, is a carcinogen and may be linked to obesity, cardiovascular disease and diabetes(15), (16), (17). A diet that is too high in sugar has been shown to increase your risk of dying of heart disease (even if you are not overweight)(18). High sugar levels are linked to insulin resistance(19) and insulin resistance is linked to increased cancer risk(20). Furthermore, high sugar levels may effect cancer survival(21), (22). And if that’s not enough, excess sugar has been shown to have similar toxic effects to the liver as alcohol does(23), (24). There are also the little pleasures in life that may be missing from a diet that doesn’t contain anything fresh. In your mind think of a fresh peach – the bright “alive” colour, the scent, the texture of the ripe flesh – and now think of tinned peaches. Quite a different experience! I used the McCance & Widdowson’s Composition of Foods Integrated Dataset (COFIDS) for food values. COFIDS is an online public domain dataset that contains nutrient values for 3,423 foods, comprising of 185 individual nutrients(25). Not all foods could be found in the data tables, for example meatballs in the parcel were chicken and COFIDS only have pork and beef; similarly no data for pot noodle so boiled noodles values were used instead. I have assumed that all of the product will be consumed, for example the juice in the fruit cocktail and peaches will be consumed along with the solid fruit. No distinction has been made between total sugars and free sugars when calculating sugar values. Not all sugar values were available (e.g., biscuits). There is a 500g bag of sugar in the parcel – assumption is that the full amount will not be used in three days. Allowance for 4g (one teaspoon) x 5 per day = 20g/day is included. Figures are based on consumption of an adult male 13 stone/83kg. RDA’s are taken from NHS website June 2014(10). If you would like to see my detailed COFIDS analysis please contact me. 1. NHS. 5 A DAY: what counts? : NHS; 2013 [cited 2014 24 June]; Available from: http://www.nhs.uk/Livewell/5ADAY/Pages/Whatcounts.aspx. 2. NHS. A DAY portion sizes. NHS; 2013 [cited 2014 24 June]; Available from: http://www.nhs.uk/Livewell/5ADAY/Pages/Portionsizes.aspx. 3. World Health Organisation. WHO opens public consultation on draft sugars guideline. World Health Organisation,; 2014 [cited 2014 24 June]; Available from: http://www.who.int/mediacentre/news/notes/2014/consultation-sugar-guideline/en/. 4. Greenfield HSDAT. Food composition data : production, management, and use. London; New York: Elsevier Applied Science; 1992. 5. Mayer A-M. 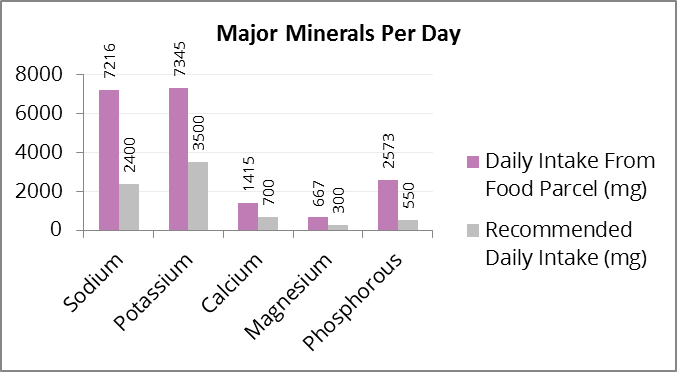 Historical changes in the mineral content of fruits and vegetables. British Food Journal. 1997;99(6):207-11. 6. Thomas D. A Study on the Mineral Depletion of the Foods Available to us as a Nation over the Period 1940 to 1991. Nutrition and Health. 2003;17(2):85-115. 7. Hurren CAMHEA. The scientific basis of nutrition education : a synopsis of dietary reference values: Health Education Authority; 1996. 8. Buttriss J. Nutrient requirements and optimisation fo intakes. British Medical Bulletin. 2000;56(1):18-33. 9. Gaby A. A-Z guide to drug-herb-vitamin interactions : improve your health and avoid side effects when using common medications and natural supplements together. New York: Three Rivers Press; 2006. 10. NHS. Vitamins and minerals. 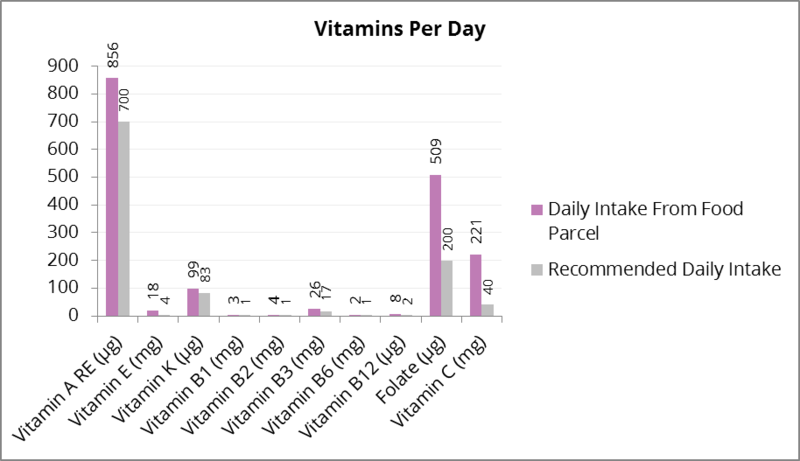 NHS; 2012 [cited 2014 24 June]; Available from: http://www.nhs.uk/conditions/vitamins-minerals/Pages/vitamins-minerals.aspx. 11. U.S. Department of Health and Human Services. Health Information, Calcium – Dietary Supplement Fact Sheet. 2013 [cited 2014 24 June]; Available from: http://ods.od.nih.gov/factsheets/Calcium-HealthProfessional/. 12. Mulholland CA, Benford DJ. What is known about the safety of multivitamin-multimineral supplements for the generally healthy population? Theoretical basis for harm. The American Journal of Clinical Nutrition. 2007;85(1):318S-22S. 13. BBC. Eating canned soup ‘poses a chemical risk’. 2011 [cited 2014 25 June]; Available from: http://www.bbc.co.uk/news/health-15834072. 14. Carwile JL, Ye X, Zhou X, Calafat AM, Michels KB. Canned soup consumption and urinary bisphenol a: A randomized crossover trial. JAMA. 2011;306(20):2218-20. 15. Huang YQ, Wong CKC, Zheng JS, Bouwman H, Barra R, Wahlström B, et al. Bisphenol A (BPA) in China: A review of sources, environmental levels, and potential human health impacts. Environment International. 2012;42(0):91-9. 16. European Food Safety Authority (EFSA). Opinion of the Scientiﬁc Panel on Food Additives, Flavourings, Processing Aids and Materials in Contact with Food on a request from the Commission related to 2,2-bis (4-hydroxyphenyl)propane (bisphenol A) 2006: Available from: http://www.efsa.europa.eu/en/efsajournal/doc/afc_op_ej428_bpa_op_en,1.pdf. 17. Lang IA, Galloway TS, Scarlett A, et al. Association of urinary bisphenol a concentration with medical disorders and laboratory abnormalities in adults. JAMA. 2008;300(11):1303-10. 18. Yang Q, Zhang Z, Gregg EW, Flanders W, Merritt R, Hu FB. Added sugar intake and cardiovascular diseases mortality among us adults. JAMA Internal Medicine. 2014;174(4):516-24. 19. Lana A, Rodríguez-Artalejo F, Lopez-Garcia E. Consumption of Sugar-Sweetened Beverages Is Positively Related to Insulin Resistance and Higher Plasma Leptin Concentrations in Men and Nonoverweight Women. The Journal of Nutrition. 2014;144(7):1099-105. 20. Arcidiacono B, Iiritano S, Nocera A, Possidente K, Nevolo MT, Ventura V, et al. Insulin Resistance and Cancer Risk: An Overview of the Pathogenetic Mechanisms. Experimental Diabetes Research. 2012;2012:12. 21. Krone CA, Ely JTA. Controlling Hyperglycemia as an Adjunct to Cancer Therapy. Integrative Cancer Therapies. 2005;4(1):25-31. 22. Meyerhardt JA, Sato K, Niedzwiecki D, Ye C, Saltz LB, Mayer RJ, et al. Dietary Glycemic Load and Cancer Recurrence and Survival in Patients with Stage III Colon Cancer: Findings From CALGB 89803. Journal of the National Cancer Institute. 2012;104(22):1702-11. 23. Lustig RH, Schmidt LA, Brindis CD. Public health: The toxic truth about sugar. Nature. 2012 2012/02//;482(7383):27-9. 24. Kavanagh K, Wylie AT, Tucker KL, Hamp TJ, Gharaibeh RZ, Fodor AA, et al. Dietary fructose induces endotoxemia and hepatic injury in calorically controlled primates. The American Journal of Clinical Nutrition. 2013;98(2):349-57. 25. Food Standards Agency. McCance & Widdowson’s Composition of Foods Integrated Dataset. Food Databanks; 2002 [updated 25 June 2014; cited 2014 24 June]; Available from: http://tna.europarchive.org/20110116113217/http://www.food.gov.uk/science/dietarysurveys/dietsurveys/.